Let's assume for NOW that you are the ONLY person using the mac. In the More Users chapter (link at the right) we'll explain how you have to handle a huge family of users. 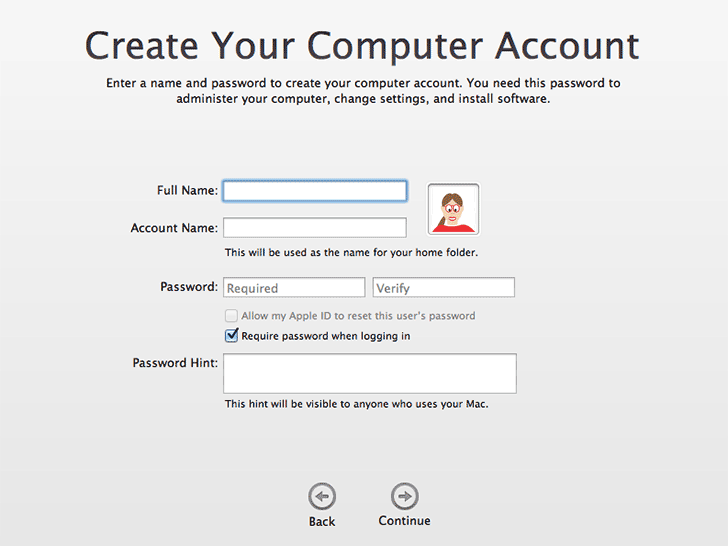 The very first time that you'll boot Mac OS X, the system will ask you for an Account name and a Password. Choose them well; you'll meet them the rest of the time you'll be using your Mac. In case of installing programs or changing important System Preferences your Account and Password will be asked. As you are the only person using the machine, you won't need to give your password when you log on. 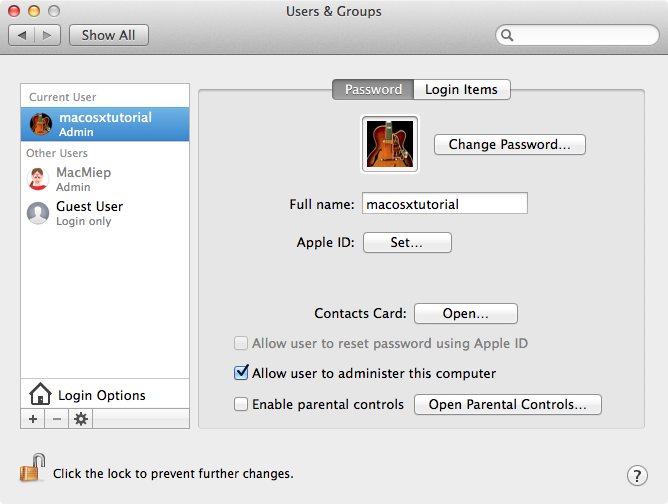 At default, the Mac is on 'Automatic login'. However, you need to realize that at the background there is a log on procedure. As the only user you are also the Admin user. The Admin is a User who is allowed to do things like installing programs and change important system preferences. In case you are the only user, you are automatically the Admin too! So this is the reason you need to remember your login name and password, although your are logging on automatically! 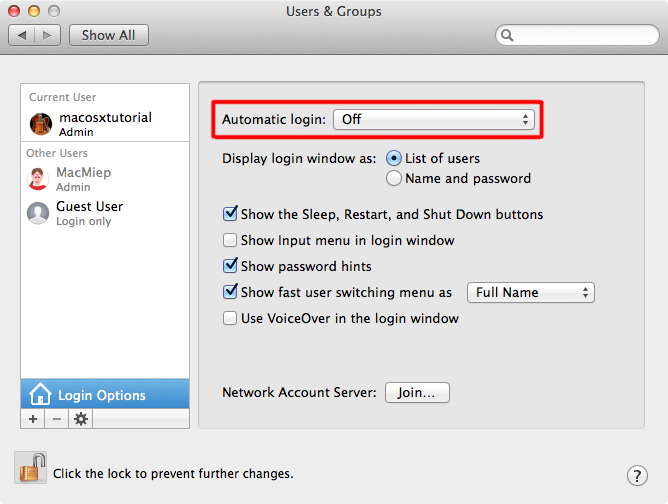 Automatic login is convenient, this way anyone can use your Mac without permission. Would you rather prefer your Mac asking you for a password at logging in? 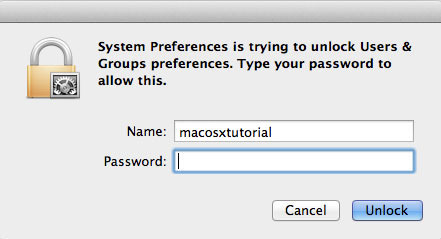 Go to System Preferences => Users & Groups. Note: If needed, first click the lock at the lower right to unlock Users & Groups with your Admin user name and password. Go to the Automatic Login and choose 'Off' to turn off Automatic login. Choose 'Change password' to insert a new one. But you can't change it without using the old one first! Well, you can't change your login name. So choose it wisely. Are you mistaken, then you have to make a new account first and then delete the old one. How to do that, you'll find in the More Users chapter (on the right, in blue). An Apple ID is an email address and a password. You'll need it to buy and download software from the App Store. Even if the software is for free you'll need it. In case you have an iPhone or iPad, you can't live without an Apple ID. Do I have to have an Apple ID? 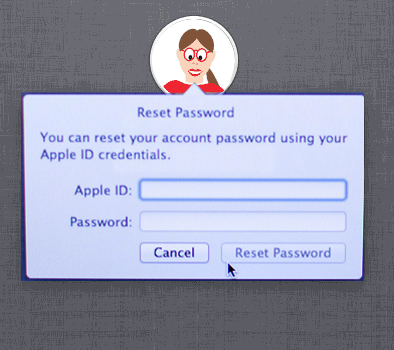 First, you have to connect your Mac OS X account and your Apple ID. Do this as soon as you get your new Mac. 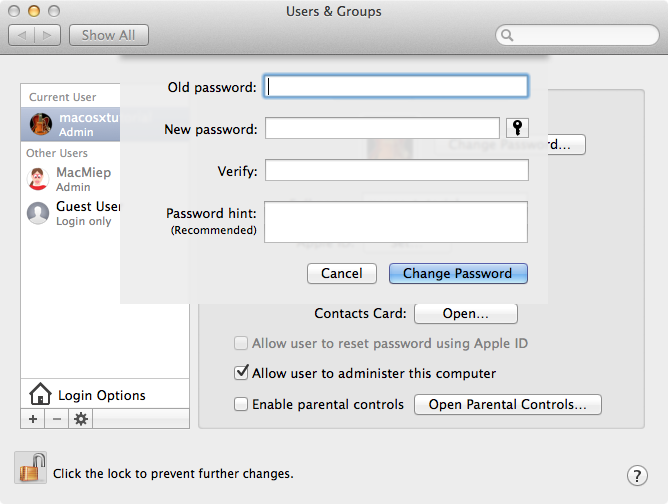 You can connect both in System Preferences => Users & Groups. Select your user name. Then choose Apple ID: Set... Now you fill in your ID. Don't have an Apple ID yet? 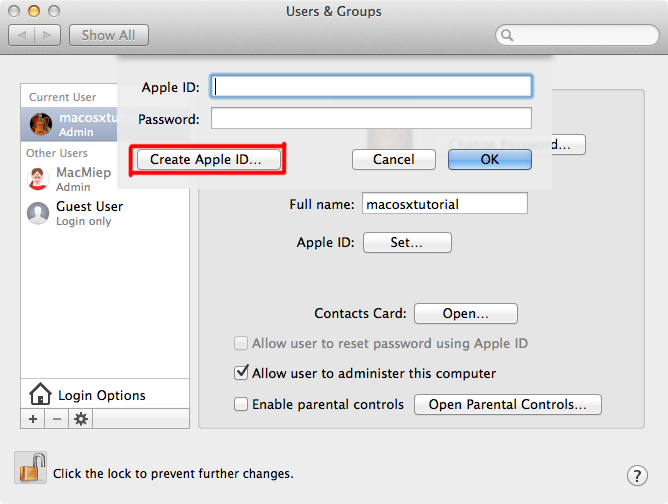 Use the 'Create Apple ID...' button to make one. Now your Apple ID and your OS X account are connected. In case you lose your password, you can use your Apple ID to log on to your Mac and change the password. My login name is MacMiep and my password is.... eh... I forgot. What do I do? I give a false password three times. And then this screen appears saying: 'You can install a new password using your Apple ID'. Note: Do mind that after using this emergency solution, you will have to re-enter all your passwords for email and websites and stuff! This is for security reasons. More about getting your whole family using one Mac Multiple Users on a Mac.